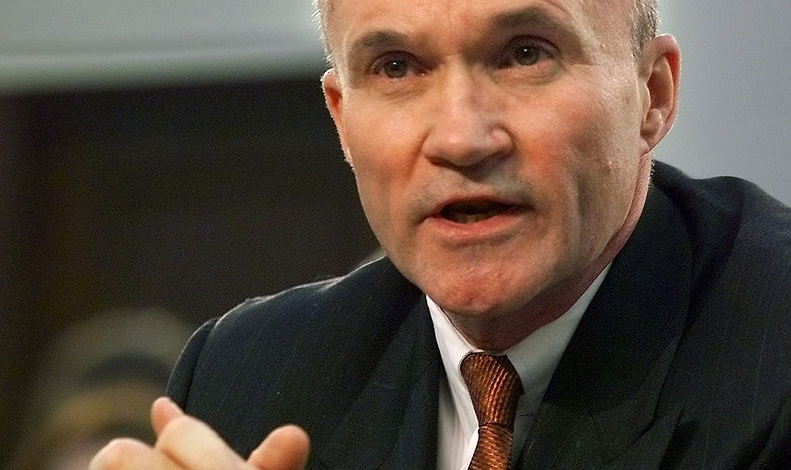 Former commissioner of the New York Police Department Raymond Kelly shared insights from his career during Youngstown State University’s spring Skeggs Lecture at Stambaugh Auditorium Tuesday. The lecture — in a departure from other Skeggs Lecture events — was presented as a conversation between Kelly and Adam Earnheardt, the chair of the department of communications. Earnheardt lead the conversation, asking Kelly to shed light on his early life, military career, academic pursuits and his time serving in the NYPD. Kelly served in Vietnam and attended the police academy shortly after his return from the war. He became an officer after graduating first in his class and — while still serving as a Marine reservist and helping to raise his newborn son — began law school shortly thereafter. During his discussion, Kelly emphasized the importance of education and communication skills for law enforcement officers, arguing that all police should be required to hold a bachelor’s degree before serving. He argued that a lack of effective and prompt communication between the police and the public were major exacerbators in the Ferguson protests. Following his first tenure as NYPD commissioner, Kelly was made the director of the International Police Monitors and oversaw the rehabilitation of Haiti’s police in 1994. Returning to the commissioner’s office in 2002 under New York City mayor Michael Bloomberg, Kelly spearheaded several community policing programs such as cricket and soccer games meant to strengthen the NYPD’s relationships with Southeast Asian, Latin American and Middle Eastern New Yorkers. He also helped build a state of the art “real-time crime center” war room for the NYPD. Kelly’s focus on improving information networks became a more obvious priority for the commissioner following the Sep. 11 terrorist attacks. At the time of the attacks, Kelly was living only two blocks away from the World Trade Center and was displaced from his home due to the fallout of the attacks. Despite this displacement, Kelly made it a point to be present each time a deceased member of the NYPD was pulled from the rubble. Following 9/11, Kelly’s policing focus widened, focusing as much on anti-terror operations as community policing. The NYPD currently has a presence in several cities worldwide, and the number of officers employed by the department is larger than the entire FBI. During his time in Youngstown, Kelly visited with upcoming graduates of YSU’s police academy. The event drew a large number of police officers and other law enforcement personnel. Evan Beil, a recent graduate of YSU’s police academy and a current Boardman police officer, was at the event and had the opportunity to meet Kelly. Like Kelly, Beil is working as an officer while finishing his undergraduate degree. He plans to graduate with a business degree. Following the main discussion, Kelly was available for a Q&A session. He fielded questions concerning his training philosophies for NYPD officers, his thoughts on improving relations between the deaf and the police, his use of the word “jihadist” and his defense of the controversial “stop-question-frisk” policy. The policy was criticized for being a form of racial profiling as opponents claimed African-Americans were unfairly and disproportionately targeted by the stops. Kelly stated that African-Americans were only stopped in half the total stop-and-frisk encounters, and that during a legal review of the policy the courts ultimately ruled the policy was not racial profiling. Following the questions, Kelly signed books and met with the public. The next Skeggs Lecture will take place on Sep. 24 and feature CNN anchor Anderson Cooper.